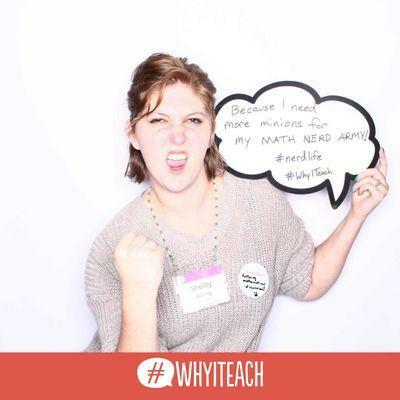 Re-Learning To Teach: Day 53: Why? We received an email from our district today with a brief survey to complete before or during our In-Service tomorrow. When I opened it, I was stopped in my tracks by the first question. After a giggle or two, I began to seriously ponder my response. I asked a few of my coworkers and got answers similar to my initial one. There were also several answer that, while serious and true, are not answers that I think are particularly good. By that, I mean that they don't allow further discussion. Much the way that when I ask my students to tell me what a sunspot is, they reply "a spot on the sun." While that's a perfectly accurate answer, it doesn't REALLY answer the question. I found that no one had an answer that they liked. The people with whom I spoke were giving either severely truncated versions of reality, or nonsense. There was a general consensus that this is a very complicated question. I think it's also a VERY important question. I firmly believe that everyone who teaches should regularly ask themselves why. I know that every time someone asks me, I have a different answer. Part of the reason for this is that as I interact with students, my reasons change. Some days, I teach because I love watching the light of recognition in the eyes of my students when they discover something new, especially about themselves and their abilities. Some days, it's because I love interacting with my students. Some days I teach because I need healthcare for my kids. When someone is trying to lose weight, they are often given the advice to not weigh themselves every day. Some days you gain weight and some days you lose, but what you want is the overall trend to be down. I think there are many parallels to teaching. Some days I have definitive purpose and other days I phone it in. As long as the overall trend is upwards towards purpose, I think I'm doing alright. My other answers are "I teach so that, eventually, I can be a teacher" and "I teach so that I can help my students discover ways to achieve their own goals." I know how @Sneffleupagus would answer! I teach because for those students who really want to learn I love working with them! I just wish I did not have to have so many disruptive students in my class. I very much hope that you are the same "Unknown" as the person who posted below. Two sides of the same coin. I teach because of those disruptive students. I am a deep down believer that every child is capable of learning, and the key to helping them learn is to get to the root problem of why they are disruptive, give them hope to overcome those problems, and show them that getting an education can help them achieve their wildest dreams. Thank you for your blog. I just learned about it. Went back and read several dozens posts. Breathed a sigh of relief that you encounter many of the things I do in middle school science. Thank you so much! I write for me, but it's always great to hear when someone else gets something out of it too. How did you learn about it, if I may ask?